A 50 yo male operated for right parietal Glioma with post operative radiotherapy. Clinically started worsening after 5th week. 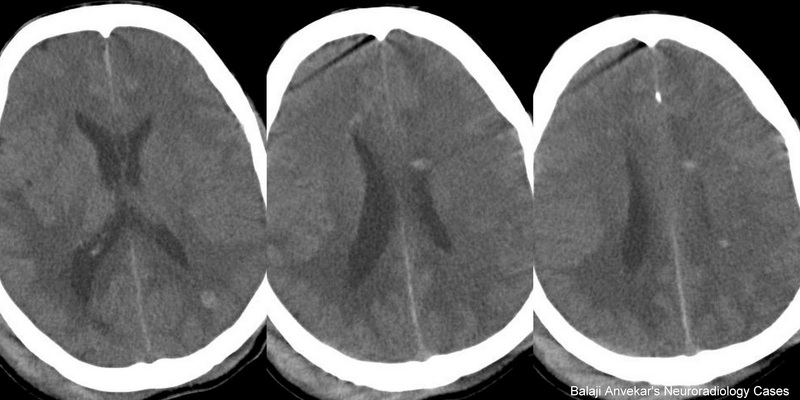 The follow up CT with MRI FLAIR and T2*GRE. Spectrum of insult includes edema, arteritis, leukoencephalopathy, mineralizing microangiopathy, necrotizing leukoencephalopathy, radiation-induced tumors and Cryptic Vascular Malformations. Acute injury: 1-6 weeks after or during treatment ; Mild and reversible, vasogenic edema. Early delayed injury: 3 weeks to several months; Edema & demyelination. Late delayed injury: Months to years after treatment; More severe, irreversible. Radiation injury: Mild focal hypodense / T2 hyper intense vasogenic edema to areas of necrosis. Radiation necrosis: Irregular enhancing lesion, single or multiple. Leukoencephalopathy: Bilateral confluent white matter hypodensity / T2 hyperintensity predominantly involve peri ventricular white matter, sub cortical U fibers involves late. Mineralizing microangiopathy: Bilateral basal ganglia and sub cortical white matter faint calcification best seen on CT. An associated cerebral cortical atrophy. Necrotizing leukoencephalopathy: Areas of white matter necrosis. Cryptic Vascular Malformation: Best seen on MRI T2* GRE as punctate low signal intensity foci represent capillary Telangiectasia. Radiation-induced neurotoxicity : Direct radiation induced Glial and WM damage. Sensitivity of oligodendrocytes is more than neurons to radiation induced damage. Effects on fibrinolytic system and immune effects. Radiation-induced vascular injury: Altered vascular permeability, endothelial and basement membrane damage, accelerated atherosclerosis, telangiectasia and cavernoma formation. Radiation-induced tumor like sarcoma seen after ~ 5 years, genetic predisposition. Distinguishing residual/recurrent neoplasm from Radiation induced Necrosis difficult using morphology alone. MRS, PET or SPECT may help delineate recurrent tumour from radiation necrosis. Reference: DI Anne G Osborn. Your blog is so interesting and very informative; the quality you used in penning this is excellent. Thanks for posting this.